From all directions they came in late summer 1851--Plains Indian tribes, summoned by government officials so their chiefs could smoke the peace pipe and sign a treaty with representatives of "The Great Father." Never before had so many American Indians assembled to parley with the white man. (Estimates range from 8,000 to 12,000.) It was perhaps history's most dramatic demonstration of the Plains tribes' desire to live at peace with the whites. The tribes had been invited to assemble at Fort Laramie, but a shortage of forage for their thousands of horses caused the parley to be moved downstream. Because some tribes had been at war for generations, most Indian camps were widely spaced to minimize contact. About 270 soldiers were present to help keep the peace. However, a spirit of friendliness prevailed. Among those helping bring the tribes together were mountain man and trailblazer Jim Bridger and Jesuit Father Peter De Smet, the beloved "Blackrobe" who worked 50 years among the Indians. 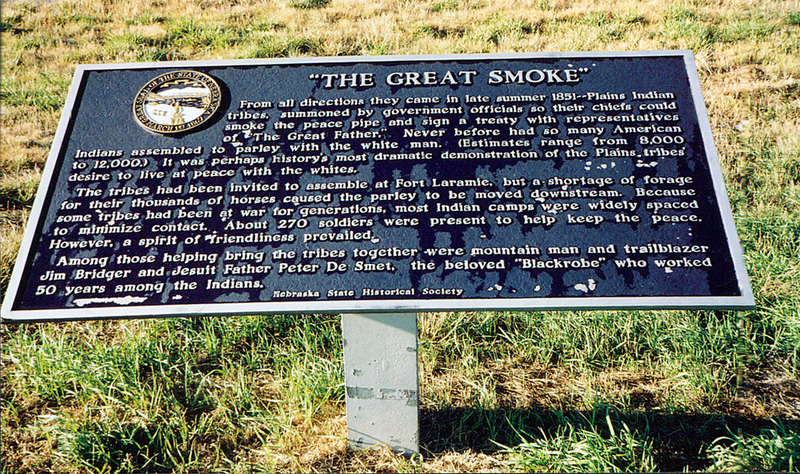 “The Great Smoke,” Explore Nebraska History, accessed April 19, 2019, https://mynehistory.com/items/show/464.